This classic pair complements your existing seating arrangement, offering sophisticated seating for one. 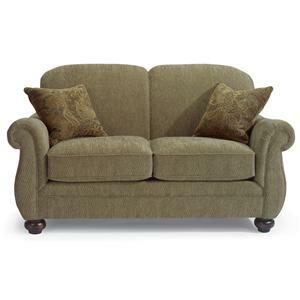 The arm chair features an upholstered back, box seat cushion and rolled arms in a delicate scroll shape. 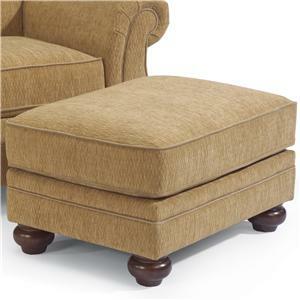 The coordinating ottoman continues the welt cord trim and neat bun feet used on the chair for a harmonious finish. 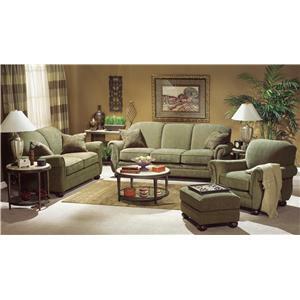 Pair with an accent table and lamp to create a cozy reading corner. The Winston Upholstered Arm Chair with Ottoman by Flexsteel at Hudson's Furniture in the Tampa, St Petersburg, Orlando, Ormond Beach & Sarasota Florida area. Product availability may vary. Contact us for the most current availability on this product. 5997-10 Arm Chair 1 41" 38" 38"
5997-08 Ottoman 1 31" 23" 18"
The Winston collection is a great option if you are looking for Traditional furniture in the Tampa, St Petersburg, Orlando, Ormond Beach & Sarasota Florida area. 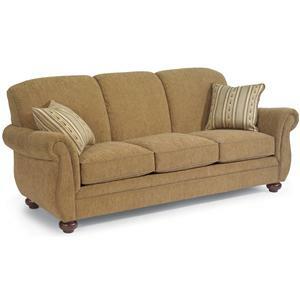 Browse other items in the Winston collection from Hudson's Furniture in the Tampa, St Petersburg, Orlando, Ormond Beach & Sarasota Florida area.